What was unique about dinosaur feet? The feet of dinosaurs were very different than those of humans. Because of their unique foot structure, most dinosaurs walked on their toes. There were a number of advantages to toe walking. For example, walking on toes increased a dinosaur’s leg length, which in turn increased the animal’s stride lengths. This translated into more speed, especially for bipedal dinosaurs such as the theropods and some herbivores like the ornithopods. The advantage was better hunting or ability to escape. This type of motion also saved energy because the body didn’t have to be raised and lowered every time the foot was lifted. The toes of most dinosaurs’ feet were normally long and slender, which allowed the animals to grip the ground and have better balance. Most of the dinosaurs had only three toes for walking or running. We see the result in former muddy or sandy areas as dinosaur trackways complete with bird-like footprints. Not every dinosaur had three long and slender toes. There were some exceptions. For example, large quadrupeds, such as the sauropods, had feet more like those of today’s elephant, with short and broad toes. Some dinosaur species had bony structures in their skins (osteoderms). 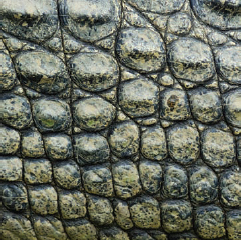 Today, crocodillian species still have osteodermic skin, though the bone embedded in the hide is concealed beneath the surface (iStock).